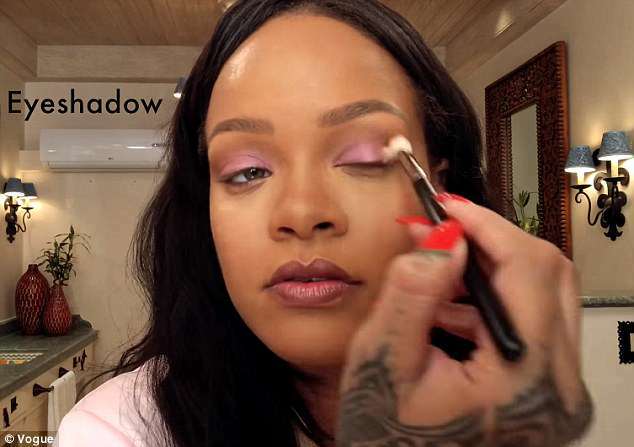 The 30-year-old Vogue cover star gave the magazine a video make-up tutorial using her favorite products from her Fenty Beauty line, and she was candid about why she incorporated contouring into her 10-minute routine. 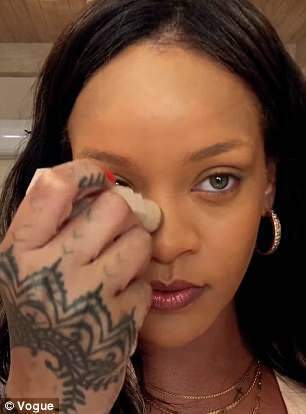 Rihanna starts her routine with her Pro Filt'r Soft Matte Longwear Foundation, using an egg-shaped make-up sponge to spread it all over her face. Then, using her Match Stix Matte Skinstick in Mocha, she contours her cheeks, forehead, and nose to her liking. 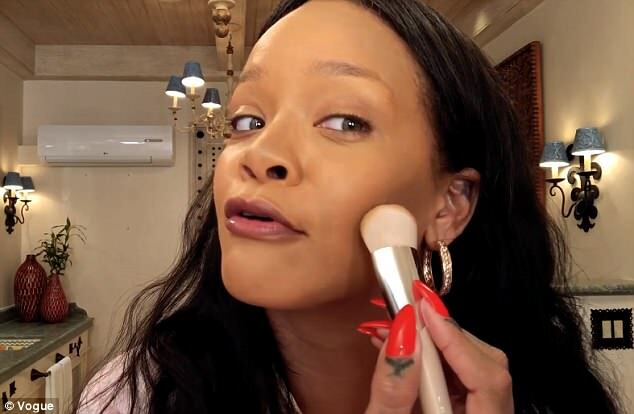 The singer stresses that it is 'very important to contour your face for your face, not the way you see on every YouTube tutorial,' because everyone's face shape is different. 'Hide that double chin,' she says while while contouring the area right above her neck. 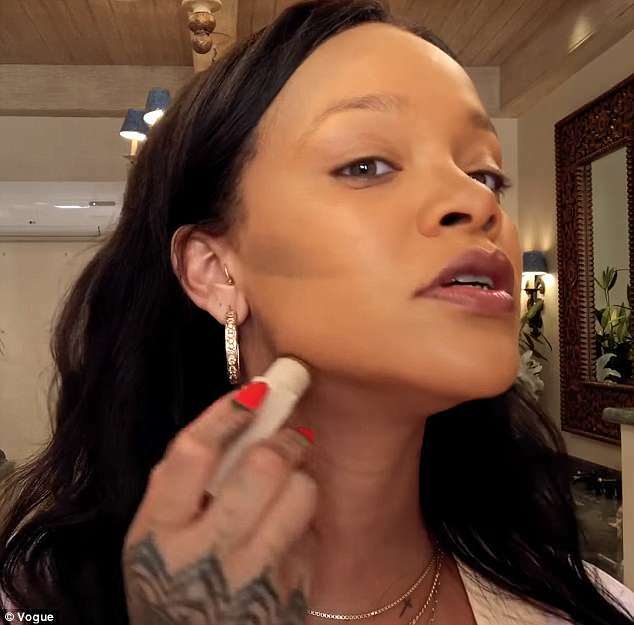 To give yourself that 'whole long neck situation,' the singer advises making a triangle under your neck when contouring. 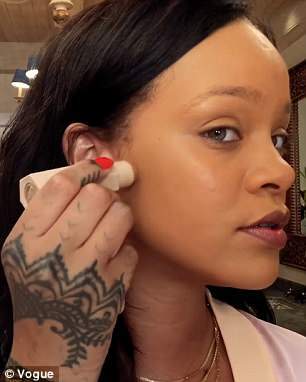 After blending her contour in, she moves on to concealer, which is clearly one of her must-have products. 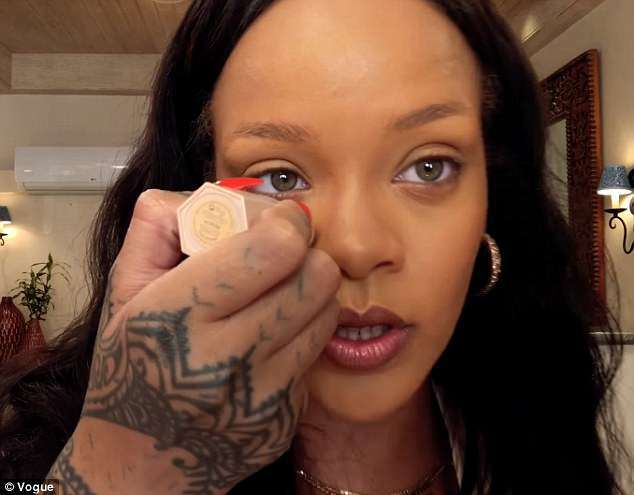 'Everybody knows concealer is made for hiding bags and dark circles and hangovers and bad decisions,' she says as she spreads a lighter Match Stix Matte Skinstick under her eyes. Next up is her Invisimatte Blotting Powder, which she uses to set her make-up and contour, and, of course, keep her face shine-free. 'When you get greasy on the fly, honey, it is no joke,' she explains. 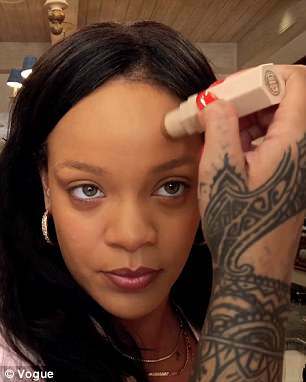 Rihanna then applies bronzer to all the areas she contoured before adding it to her eyelids to 'warm up' her eyes. She then uses a pink eye shadow on the top of her eyelids and a brownish hue underneath her lower lash line. 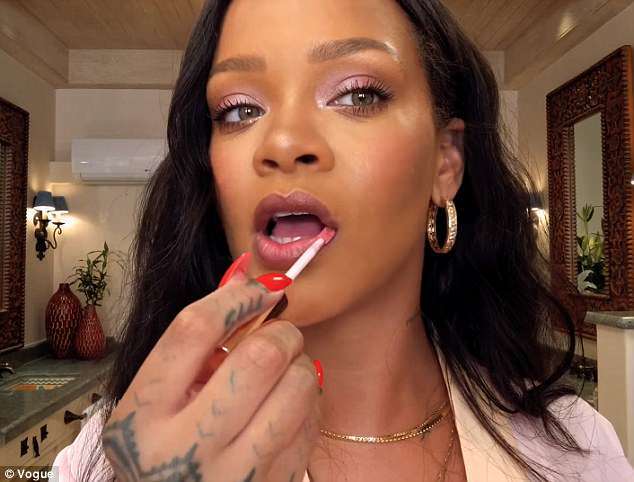 Rihanna tops off her look with a pink lip gloss featuring a gold shimmer, and she ends the tutorial by applying her Body Lava on her shoulders and chest to give her skin an extra sparkle. 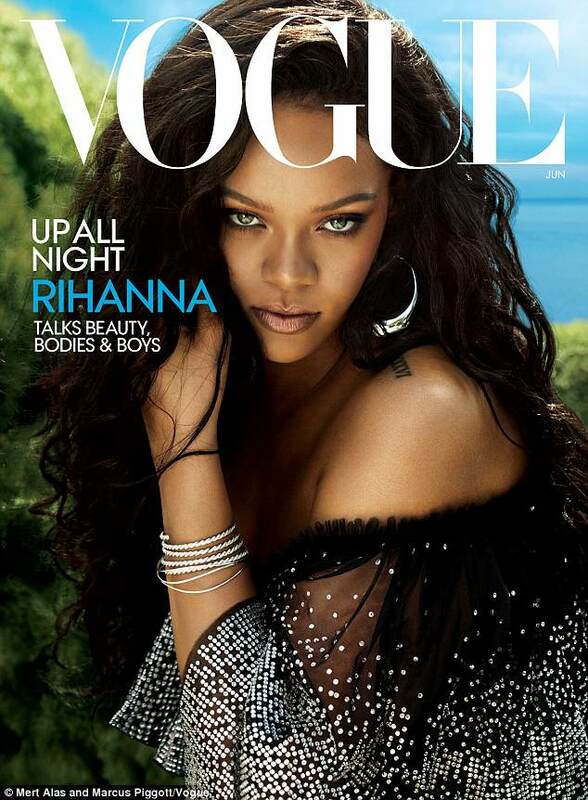 In the interview accompanying her June cover of Vogue, Rihanna opened up about her weight fluctuations and how she deals with body-shaming trolls. 'You’ve just got to laugh at yourself, honestly,' she said. 'I mean, I know when I’m having a fat day and when I’ve lost weight. I accept all of the bodies. Rihanna — who recently launched her Savage X Fenty lingerie line — has made a point of using a range of models in all shapes and sizes for her brand in the bid it helps promote body confidence. 'I’m not built like a Victoria’s Secret girl, and I still feel very beautiful and confident in my lingerie,' she said. The Ocean's 8 star also spoke about her fluctuating body type in an interview with The Cut last October. 'One day I can literally fit into something that is bodycon, and then the next day — the next week — I need something oversized; I need a little crop here and a high-waist there to hide that part, you know?' she said. 'I really pay attention every day when I go into the closet about what’s working for my body that morning,' she continued. 'I feel like that’s how everyone should go after fashion, because it’s an individual thing. In May 2017, the singer also faced cruel criticism from a writer at Barstool Sports, who posted a piece online in which he labeled Rihanna 'fat' and said her body image would 'set a dangerous precedent'. Chris 'Spags' Spagnuolo, who was later suspended from his job as a result of the public outcry over his piece, used a then-recent paparazzi image of Rihanna in New York to criticize her body. The writer acknowledged bad angles may be to blame, but also suggested that RiRi has been 'enjoying that good room service a bit too long'. 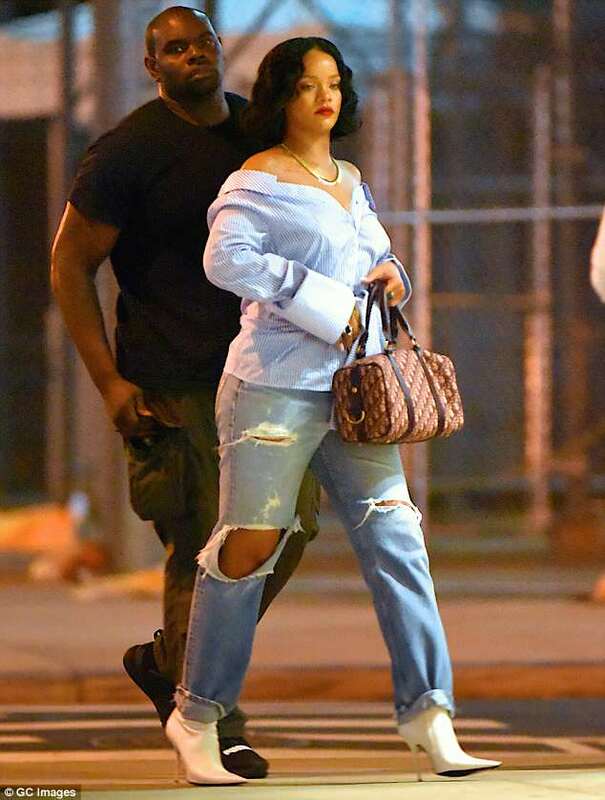 He even questioned whether Rihanna she was 'going for Ashley Graham's spot on the plus-sized hierarchy' with a tone that implied he thinks that's a bad thing. Deciding that she has, in fact, gained weight, he went on, 'that means it's time to worry if you're not a guy who fancies himself a chubby chaser'. 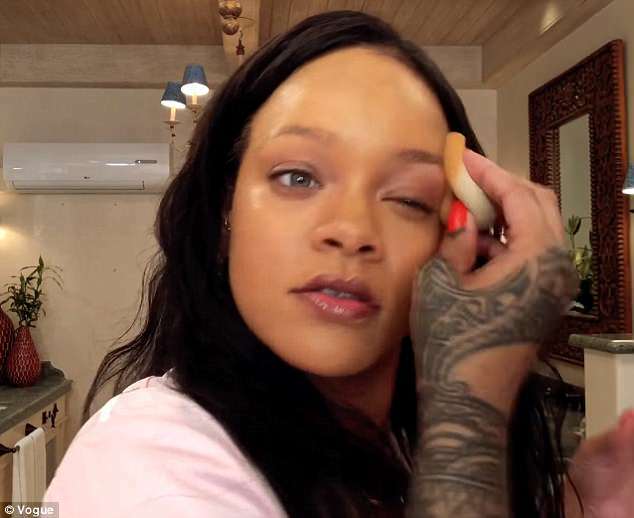 Noting that Rihanna is a big influencer, he wrote that he is worried other young women will be influenced to gain weight to look like her. 'So you see her pushing 180 and it's a tough world to stomach,' he wrote, making a dubious estimation of her weight.